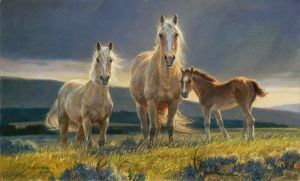 "This is the first time I have painted the Palomino horse, but it will not be the last! What a joyful experience this painting has given me! My hope is that this energy will flow outward from my easel...that this joy will be passed on. I did a fair amount of research on the Palomino breed and found out how tricky it can be to end up with that highly desireable "gold and silver" coloration, and how many variations are possible! When a new foal is born, what you see may or may not be what you get, for a Palomino foal is subject to changes in coat color as it matures. Will this foal turn golden like its mother, the central horse? Or will it become more silvery like the filly on the left? Or perhaps, it will stay dark and velvety?